Here's another great universal recipe from the Tightwad Gazette. This is one I have used many times - universal muffins. These make a delicious and inexpensive breakfast or snack. Amy Dacyczyn says: Instead of sharing a single muffin recipe, I wanted to share the process of creating muffin recipes. This will allow you to use ingredients that are cheap in your part of the country, use up odd leftovers, and accommodate dietary restrictions. The quantities listed are for a single batch of 12 muffins. Grain: Use 2 to 2 1/2 cups of white flour. Or substitute oatmeal, cornmeal, whole-wheat flour, rye flour, or flake cereal for 1 cup of the white flour. Or substitute 1 cup cooked oatmeal, rice, or cornmeal for 1/2 cup of the white flour and decrease liquid to 1/2 cup. Milk: Use 1 cup. Or substitute buttermilk or sour milk (add a tablespoon of vinegar to 1 cup milk). Or substitute fruit juice for part or all of the milk. Fat: Use 1/4 cup vegetable oil or 4 tablespoons melted butter or margarine. Or substitute crunchy or regular peanut butter for part or all of the fat. The fat can be reduced or omitted with fair results if using a "wet addition." Egg: Use 1 egg. Or substitute 1 heaping tablespoon of soy flour and 1 tablespoon of water. If using a cooked grain, separate the egg, add the yolk to the batter, beat the white until stiff, and fold into the batter (Amy later gives a better method for fluffing up batter with cooked grain, which I will give a little later). Sweetener: Use between 2 tablespoons and 1/2 cup sugar. Or substitute up to 3/4 cup brown sugar. Or substitute up to 1/2 cup honey or molasses, and decrease milk to 3/4 cup. Baking Powder: Use 2 teaspoons. If using whole or cooked grains or more than 1 cup of additions, increase to 3 teaspoons. 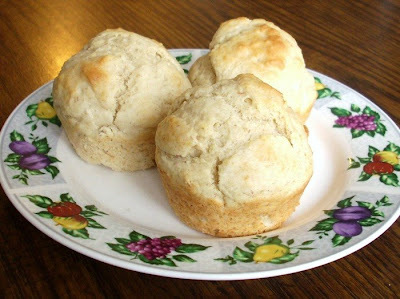 If using buttermilk or sour milk, decrease to 1 teaspoon and add 1/2 teaspoon baking soda. Salt: Use 1/2 teaspoon, or omit if you have a salt-restricted diet. The following ingredients are optional. Additions can be used in any combination, up to 1 1/2 cups total. If using more than 1 cup of wet additions, decrease the milk to 1/2 cup. Dry Additions: Nuts, sunflower seeds, raisins, coconut, and so on. Moist Additions: Blueberries, chopped apple, freshly shredded zucchini, shredded carrot, and so on. Wet Additions: Pumpkin puree, applesauce, mashed cooked sweet potato, mashed banana, mashed cooked carrot, and so on. If using 1/2 cup drained, canned fruit or thawed shredded zucchini, substitute the syrup or zucchini liquid for all or part of the milk. Spices: Use spices that compliment the additions, such as 1 teaspoon cinnamon with 1/4 teaspoon nutmeg or cloves. Try 2 teaspoons grated orange or lemon peel. 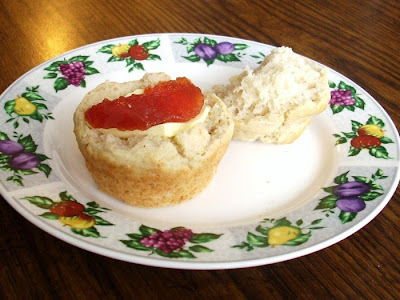 Jellies and Jams: Fill cups half full with a plain batter. Add 1 teaspoon jam or jelly and top with 2 more tablespoons batter. Topping: Sprinkle cinnamon sugar on the batter in the tins. Nonsweet Combinations: Use only 2 tablespoons sugar and no fruit. Add combinations of the following: 1/2 cup shredded cheese, 3 strips fried-and-crumbled bacon, 2 tablespoons grated onion, 1/2 cup shredded zucchini, 2 tablespoons Parmesan cheese. Spices could include a teaspoon of parsley and a pinch of marjoram. To make muffins, combine dry ingredients, and then mix in wet ingredients until just combined; the batter should be lumpy. Grease muffin tin and fill cups two thirds full. Bake in a preheated oven at 400 degrees for 20 minutes (give or take 5 minutes). I've experimented and found that I could use cooked cereals in my muffin batter with the aid of my blender. First, I mix all of the dry ingredients in a big bowl. Then I put all of the wet and moist ingredients in a blender. These could include: cooked grain (about 1/2 cup per batch), egg, milk, honey or molasses, peanut butter, pumpkin puree, applesauce, and/or banana. I've even added unused cookie dough and pastry scraps. I don't blenderize any moist ingredient that I want to retain its original texture, such as shredded zucchini. After blending, I mix the wet stuff into the bowl of dry stuff. I make a final adjustment to the batter by adding more liquid or flour. The blender seems to whip up the egg sufficiently as well as helps to quickly combine hard-to-mix-in moist stuff. I had a container of miscellaneous cooked grain in the fridge. It included couscous, brown rice, and cracked wheat. You see, I had cooked and used each of them separately, then combined them one morning to make a combination hot breakfast cereal. So this morning I had about a cup of mixed cooked grain that needed to be used. I tossed the cereal in the blender with milk, egg, oil, and a banana. I mixed in a large bowl 2 cups flour, 3 teaspoons baking powder, 1/4 cup sugar, salt, and pumpkin pie spice. Then I blended the wet stuff and added it to the dry stuff and baked in greased muffin tins (my batch made 15 muffins instead of 12). The result was a slightly banana-flavored, light and fluffy muffin. Blending the cooked grain in with the wet ingredients had an unexpected benefit - you couldn't tell by looking at the muffins that they included such bulky ingredients as brown rice and cracked wheat because they had been so nicely incorporated. Hooray! Great recipe! I"m so glad I found your blog! Can I be the first to wish you a happy bloggaversary too? I saw your little button that it is in 4 days! How exciting. Congratulations! I love how flexible these are!!! They look delicious! Wow! You would never guess those light, fluffy muffins had all that stuff in them. What a great way of using leftovers! This is great, Stephanie! Thank you for the recipe! It's so flexible...now I know we'll always have ingredients for muffins onhand. These look Delicious Stephanie! Like all your recipes! I love muffins! Those look really good stephanie. You can make alot of different muffins wit that recipe. Wow! These lok great. I love the homemade preserves on top. I will have to try this! I love these universal recipes, so handy! I'll have to print them out and put them in my kitchen. 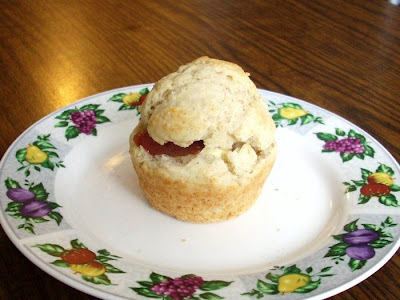 I LOVE the Tightwad Gazette and it is fun to see how how you made her "Universal muffin" recipe! What a fun Blog you have...my husband and I as well are "Frugal zealots" and are finding Joy in the Journey of frugality and seeing how good you can live and eat on not much money. I can't wait to have more time to browse through your recipes....they all look so good and frugal. The universal muffin recipe is great! I thought I'd add a "mix" recipe that I came across in a bread cook book I had from the library - I can't for the life of me remember what it was called and of course I didn't write it down!!! This can be used for a loaf or muffins. Mix all this together well. Thank you! I haven't been able to find my book since I moved, and I've been going crazy, mostly because I wanted this particular recipe. Don't know why it didn't occur to me until today to search for it, but I'm so grateful to have found it. I've been using this recipe for over 10 years. It's a wonderfully tasty way to avoid wasting use up leftovers. I'v e been using this recipe for over 10 years. If the wonderfully tasty way to avoid waste and use up leftovers. The Universal casserole recipe is also great. Valentine's Dinner - Lasagna and More!